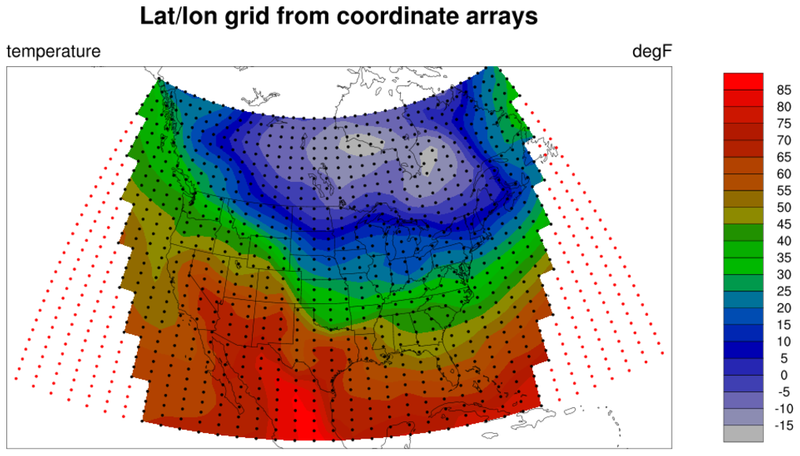 The gsn_coordinates procedure takes an existing plot and a data variable, and draws the plot again but with markers or grid lines drawn at the grid locations of your data. gsnCoordsAttachAsLines - by default, the grid locations will be drawn as filled dots, unless this resource is set to True, in which case lines will be drawn. gsnCoordsAttach - by default, when this procedure is called, the plot is drawn immediately, the markers or lines are drawn on top, and the frame is advanced. If this resource is set to True, then the markers or lines are only attached to the plot, and nothing gets drawn. You will need to call draw and frame yourself. This is useful if you need to panel plots with coordinate locations added. See datagrid_6.ncl below. gsnCoordsMissingColor / gsnCoordsNonMissingColor - By default, if you are drawing the locations as markers, they will all get drawn in black. These resources allow you to set colors for marker locations where your data is or isn't missing. In NCL version 6.6.0, gsn_coordinates was updated to allow the drawing of unstructured meshes, like triangular or hexagonal meshes. There are several examples below. 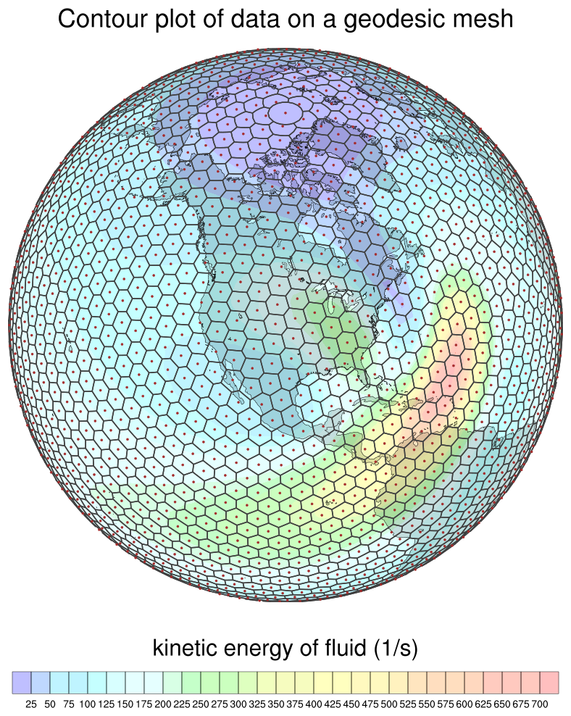 For other examples of using gsn_coordinates, see the Plotting data on a map examples page. 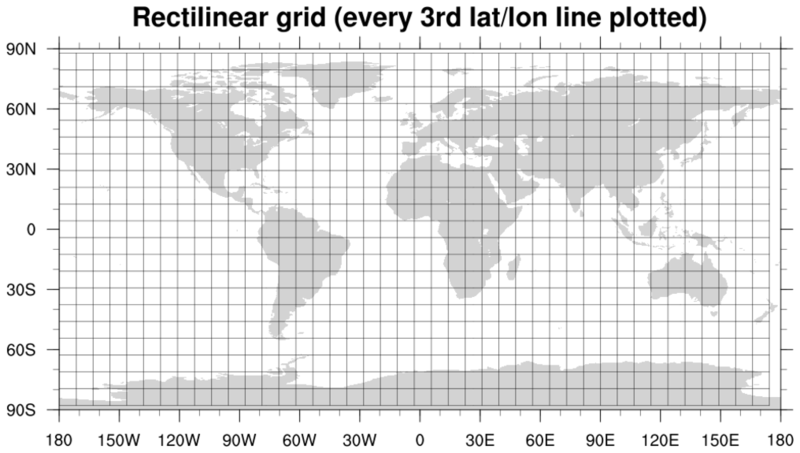 datagrid_1.ncl: This script draws the lat/lon locations of a global rectilinear grid in three ways: 1) as points, 2) as lines, and 3) as every 3rd line. Since WRF data is on a curvilinear grid you must read the lat/lon values off the file and attach them as special lat2d / lon2d attributes before calling gsn_coordinates. 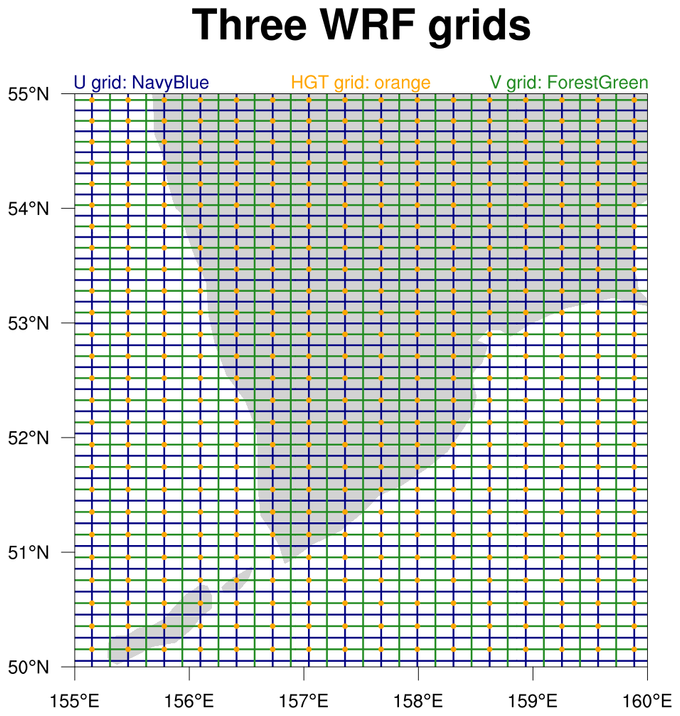 datagrid_3.ncl: This example plots the same three WRF grids as the previous example, except it plots them on one map plot that has been zoomed in so you can see the grid better. The HGT lat/lon locations are drawn in dots instead of lines. 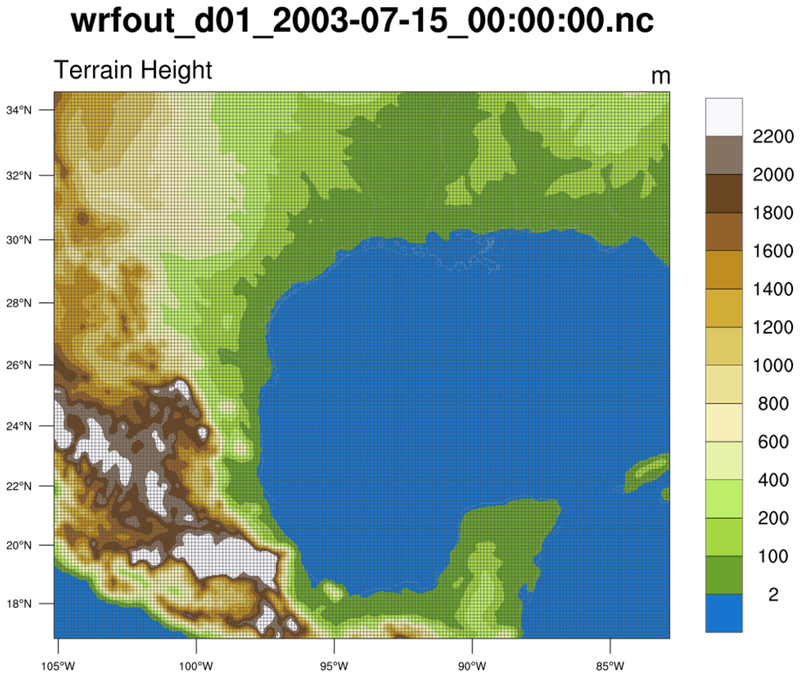 datagrid_4.ncl: This script draws a WRF lat/lon grid on top of a filled contour plot of the HGT variable, using the native map projection defined on the WRF output file. 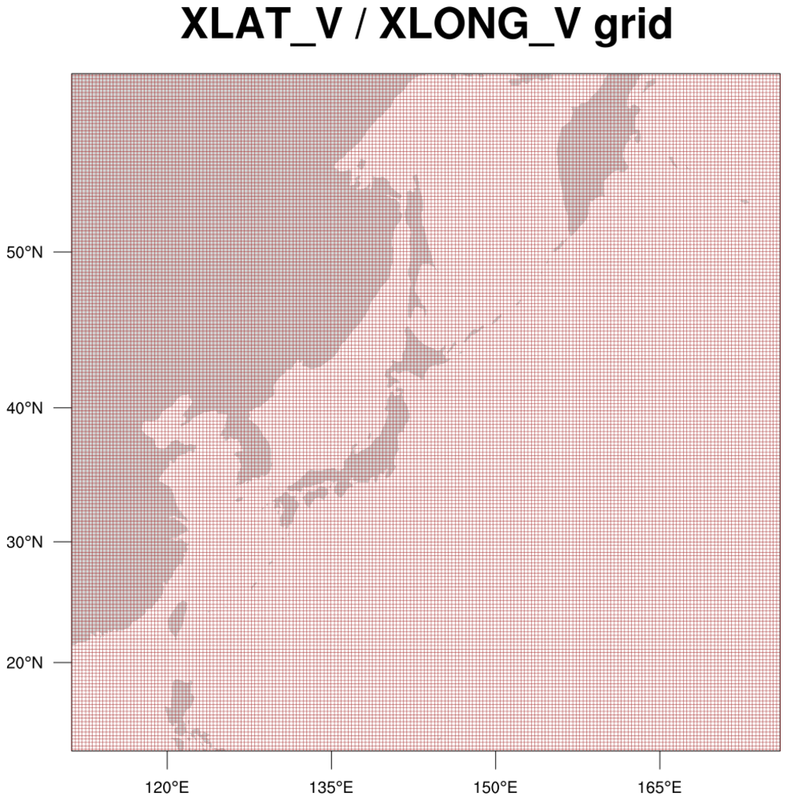 datagrid_5.ncl: This script draws the lat/lon grid of a temperature variable on a regional rectilinear grid using two methods: 1) black lines and 2) red markers where the data is missing, and black markers where it isn't. 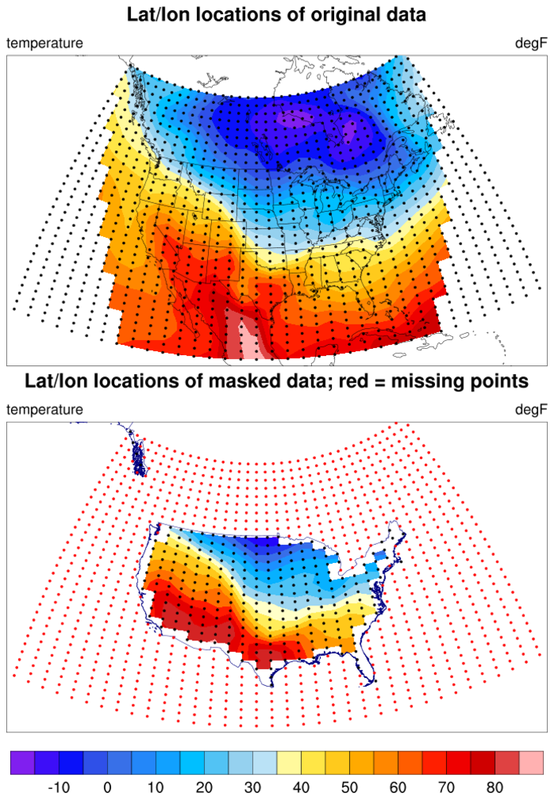 datagrid_6.ncl: This script uses the USA_adm0.shp shapefile (downloaded from gadm.org/country) to mask data on a rectilinear grid over the United States. Both the original data and the masked data have the lat/lon locations drawn as markers, with the red points indicating missing data locations. The special gsnCoordsAttach resoure is set to True, so the markers are actually attached to both plots. This is so we can panel the plots later and have the markers still be visible. shapefiles_16.ncl: This is another example of drawing data locations after you've masked the data against a shapefile. In this case, dummy data is used to create a coarse (32 x 64) grid and fine (64 x 128) grid. Both grids are masked against a Mississippi River Basin shapefile. 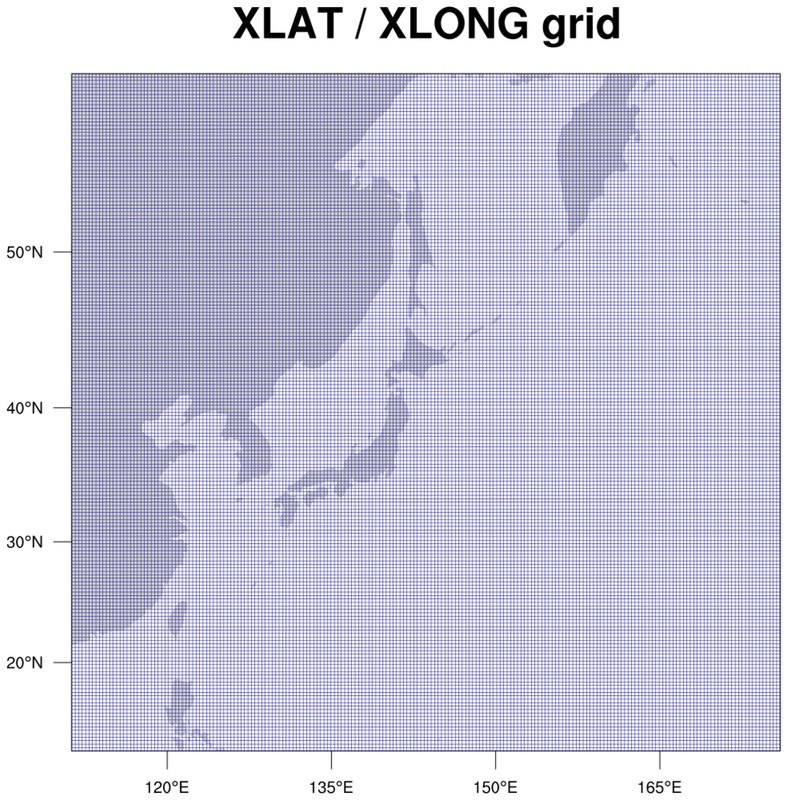 Finally, gsn_coordinates is used to draw the lat/lon grid as a set of markers on all four plots. See examples shapefiles_21.ncl and See examples shapefiles_22.ncl for more examples of masked shapefiles with data locations drawn. datagrid_7.ncl: This script draws markers for a contour plot that's not over a map. Since the data is rectilinear, the coordinate arrays are already attached to "u". 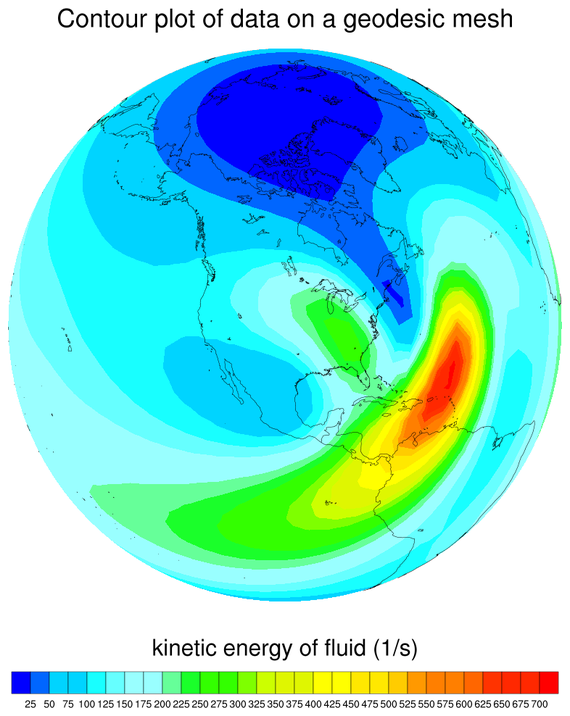 Note that the cnFillOpacityF resource is set to 0.5 to draw the filled contours partially transparent. 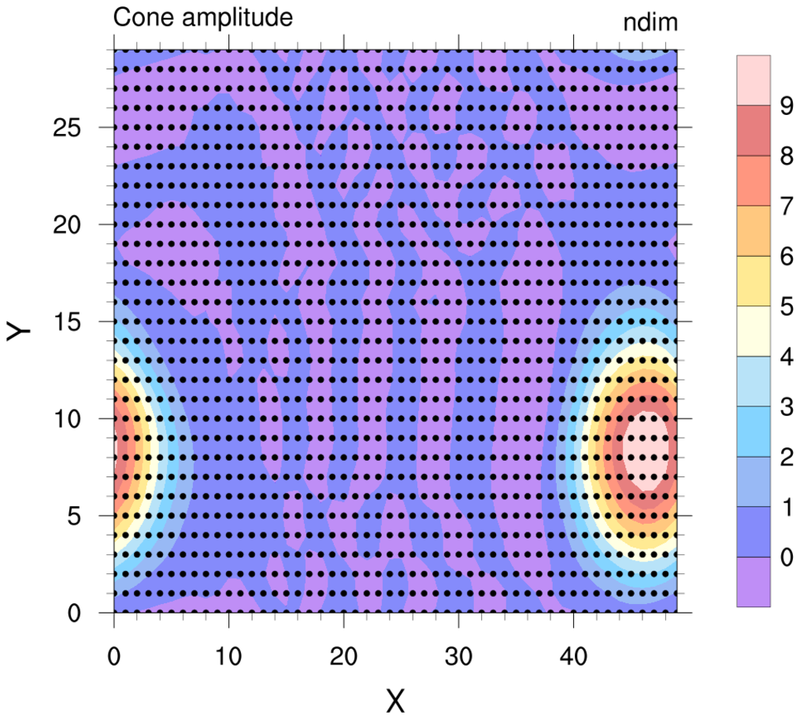 contour1d_1.ncl: The data in this example is a one-dimensional (1D) array with corresponding 1D lat/lon arrays. 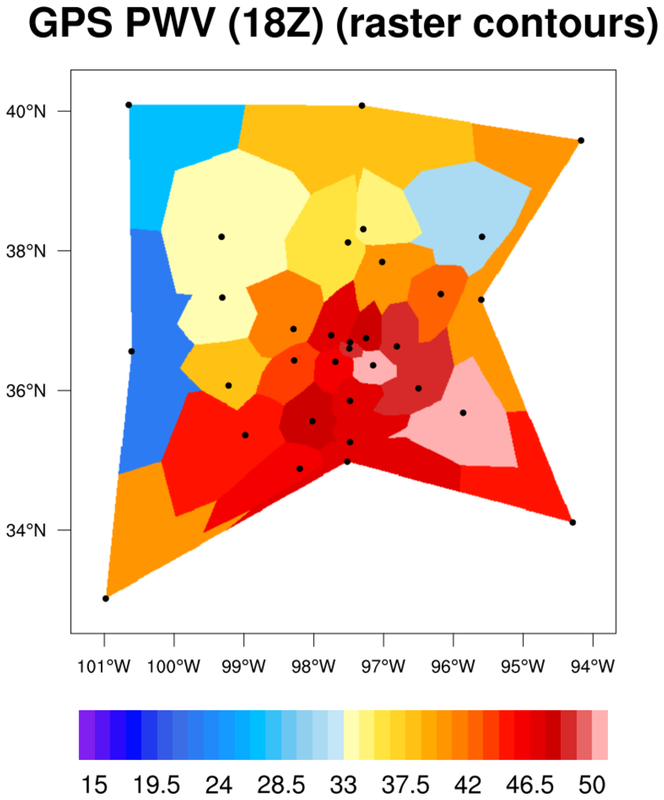 Since the "pw" data already has lat1d / lon1d attributes attached for creating the contour plot, it's easy to plot the data locations using gsn_coordinates. 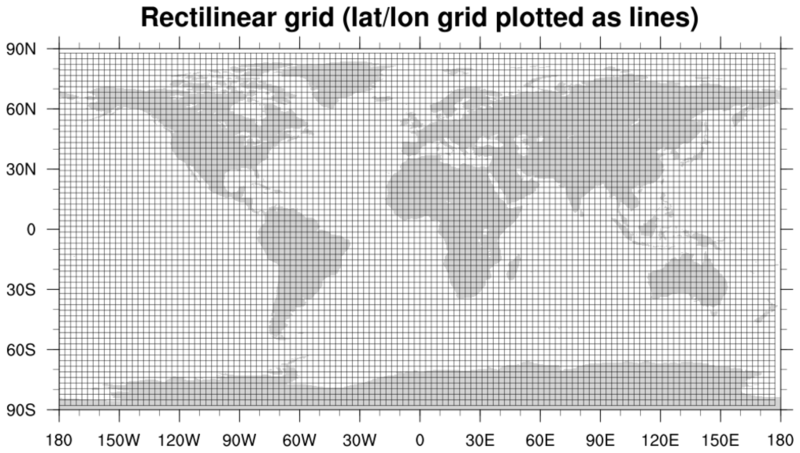 ESMF_regrid_32.ncl: Drawing lat/lon locations on plots of regridded data can be useful for debugging purposes. 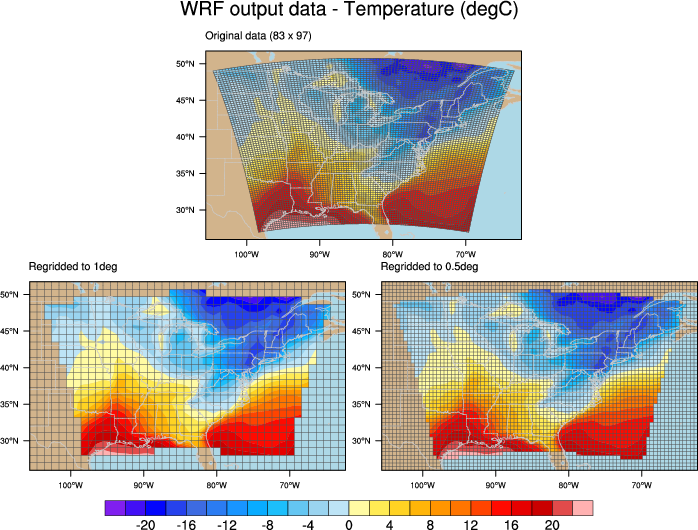 This particular example regrids WRF output temperature data to both a 1.0 and 0.5 degree grid, and compares them in a panel plot. 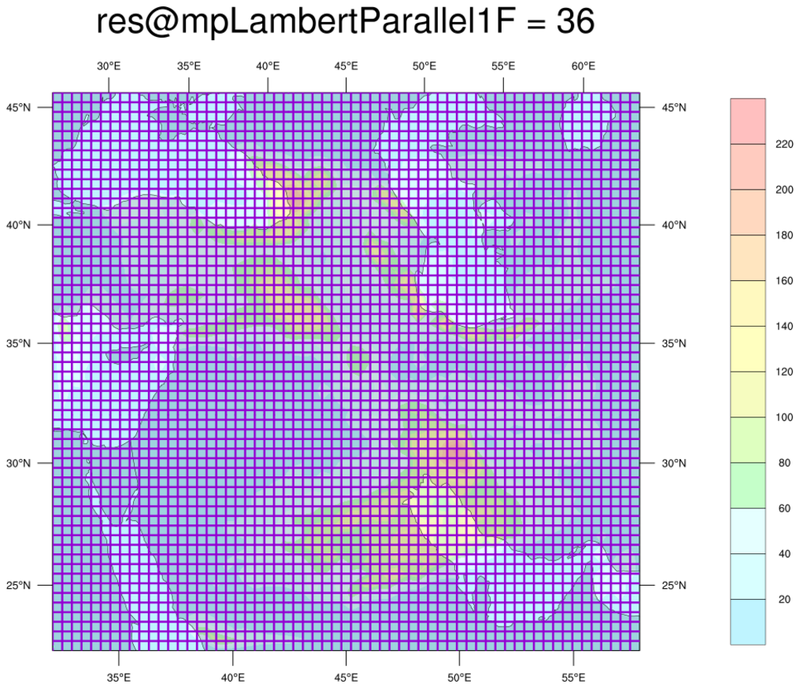 datagrid_8.ncl: This script shows how gsn_coordinates can be used to help guess at the correct map projection parameters needed to plot data in a native lambert conformal map projection. These values are usually available on the same file that the data is on. If not, then you may need to guess at these values. 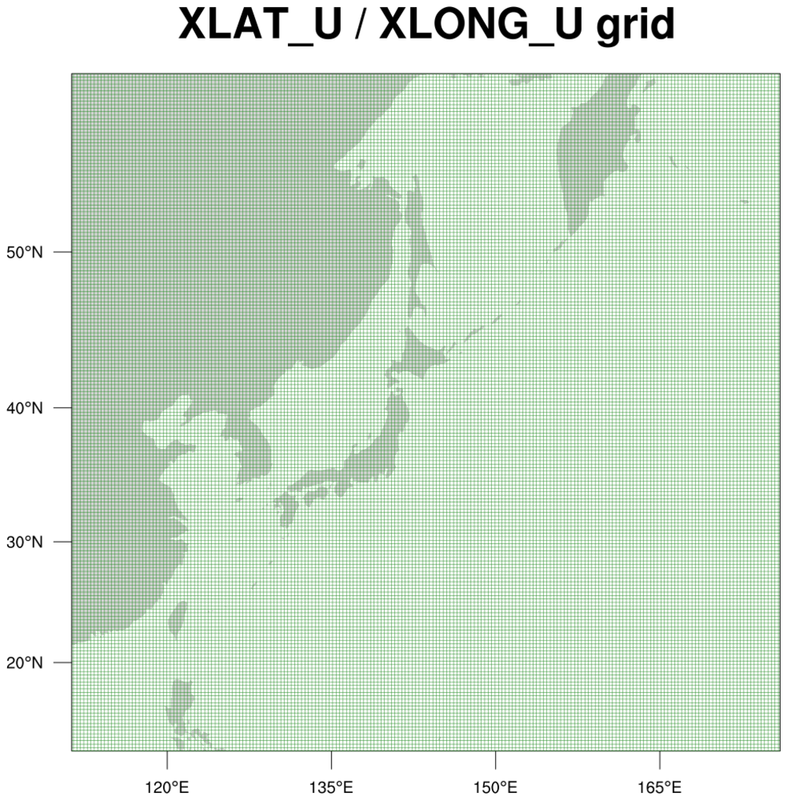 To help with the guessing process, you can draw the lat/lon grid of your data using the given map projection parameters. 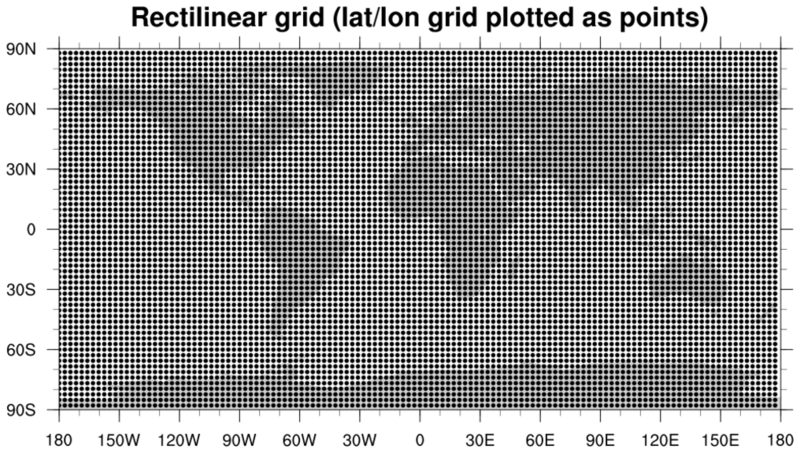 If the lat/lon grid lines are parallel and perpendicular to the rectangle that the plot is drawn in, then you likely have the correct parameters. In this example, the meridian and one of the parallel values was provided, but the other parallel value didn't look right. We used a do loop to loop through four possible values, and drew the lat/lon lines as thick purple lines for each plot. If you click on the leftmost plot (res@mpLambertParallel1F=34), you'll see the farmost right vertical grid line sticking out in the lower right corner, so this is likely not the correct value. The second-from-the-left plot (res@mpLambertParallel1F=35) is a little better, but the vertical line still sticks out a little in the lower right. In the rightmost plot (res@mpLambertParallel1F=37), the vertical lines stick out at the upper left corner. The second-from-the-right plot (res@mpLambertParallel1F=36) seems to be the best fit. Of course, you could fine tune this example by trying other values close to 36, like 35.8, 35.9, 36, 36.1, etc. geo_1.ncl: This particular geodesic grid has 2562 cells, each with 5 edges. The lat/lon cell centers are defined as 1D arrays called grid_center_lat and grid_center_lon on the file, while the cell edges are defined as 2D arrays dimensioned 2562 x 6 (ncells x nvertices), called grid_corner_lat and grid_corner_lon. 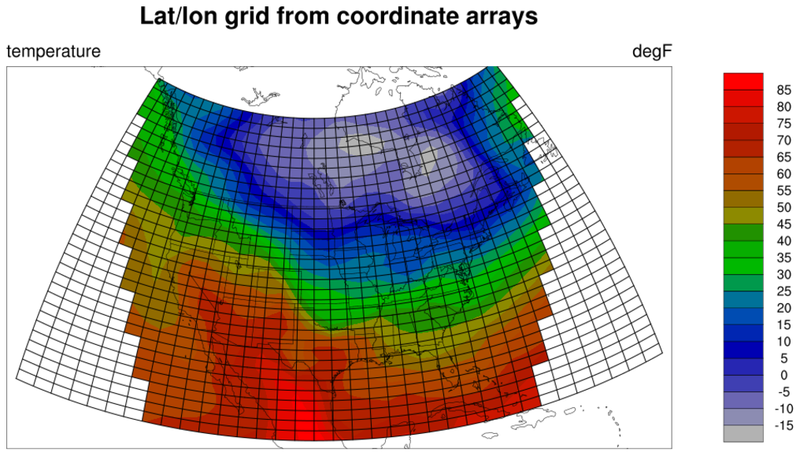 To plot this data over a map, sfXArray and sfYArray are set to the mesh centers (grid_center_lat and grid_center_lon), while sfXCellBounds and sfYCellBounds are set to the cell corners (grid_corner_lat and grid_corner_lon). Both sets of lat/lon arrays are in radians, so they have to first be converted to degrees. 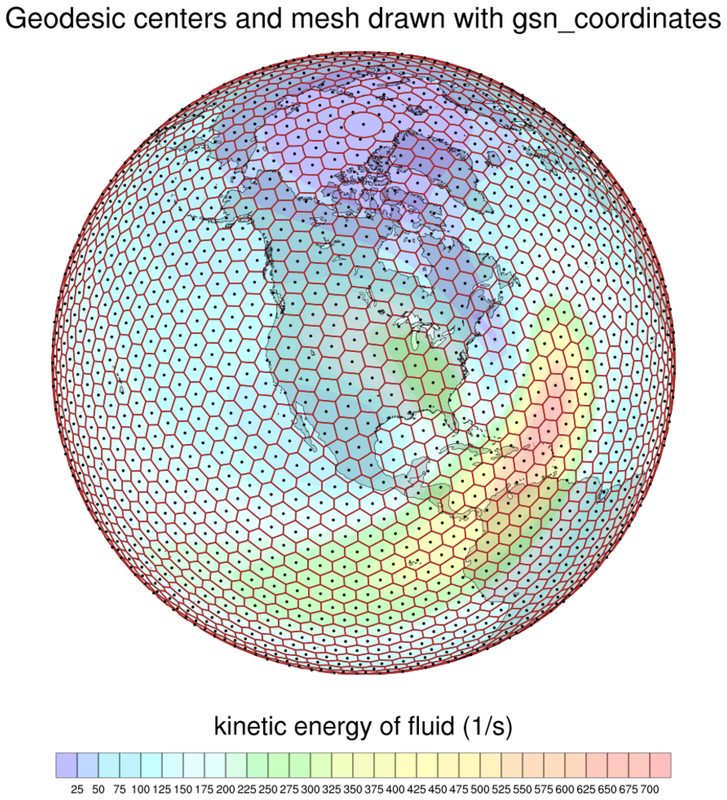 The second image draws the cell centers as filled dots, and the geodesic mesh as polylines. Note that the cell edges have to first be closed before drawing them. See the next example which uses an updated version of gsn_coordinates to draw the mesh edges and centers. 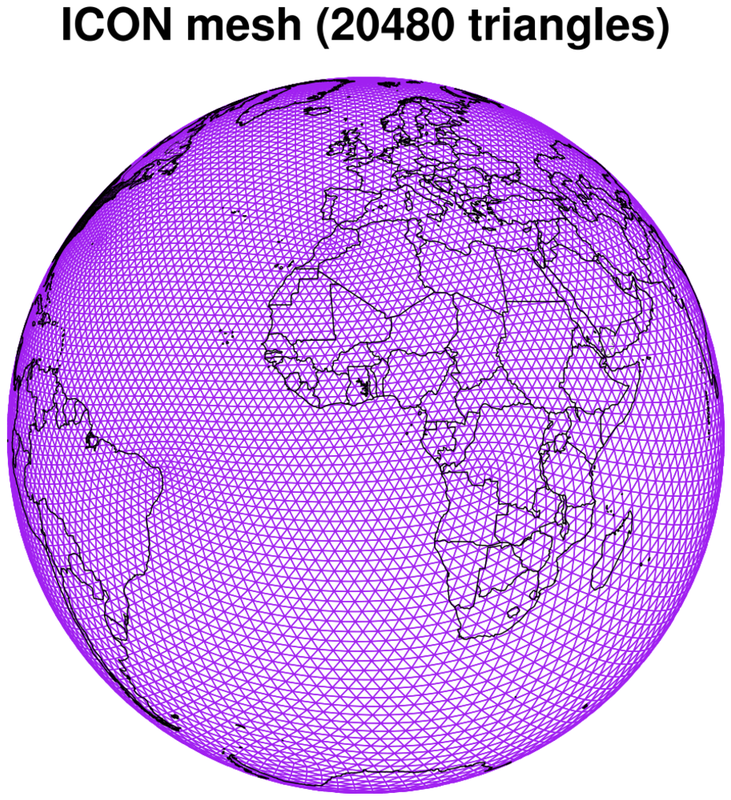 geo_1_660.ncl: This example shows how to use gsn_coordinates to draw the mesh edges of the second image from the previous example. This functionality was added in NCL version 6.6.0.
datagrid_9.ncl: This is another example of drawing the edges of an unstructured mesh, except this one is of the MPAS mesh, in which cells can have different numbers of edges. The first image is the "t2m" variable plotted over the full grid. 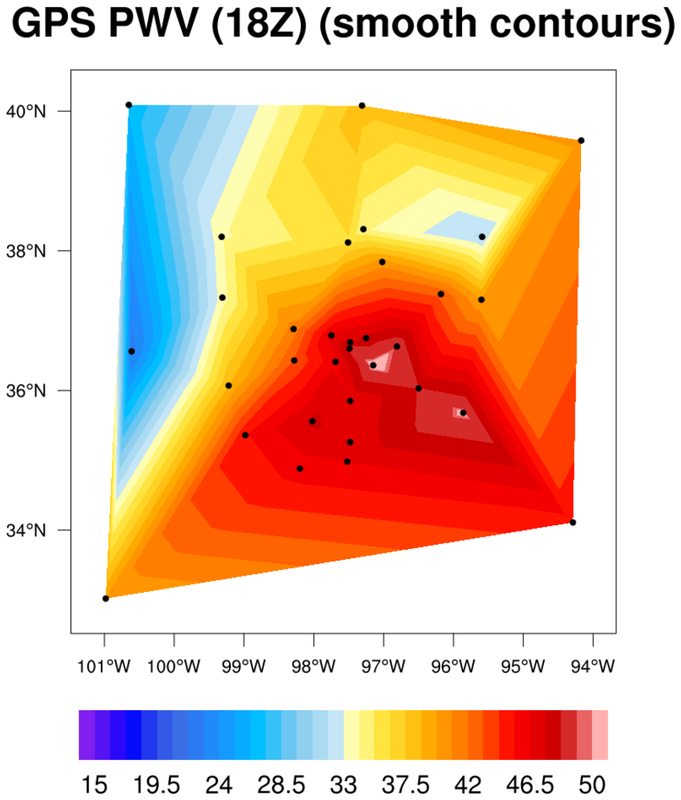 An area of interest is highlighted on this plot, which is what the second image represents. 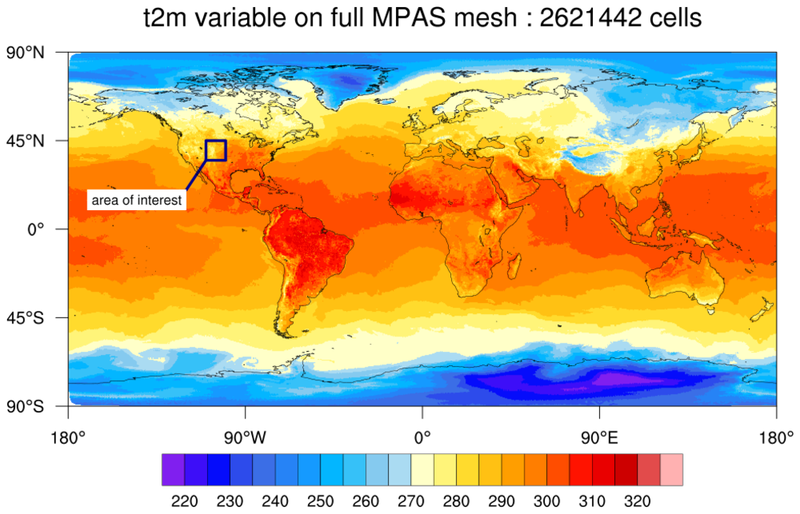 The MPAS edges and cell centers were only added to the second plot, because this particular MPAS mesh has over two million cells which would create a very dense plot if you drew all the edges. An area of interest was selected using the special gsnCoordsMinLat, gsnCoordsMaxLat, gsnCoordsMinLon, and gsnCoordsMaxLon resources, making the drawing of the mesh less dense and significantly faster. datagrid_10.ncl: This is an example of drawing the edges and centers of an ICON triangular mesh using gsn_coordinates. 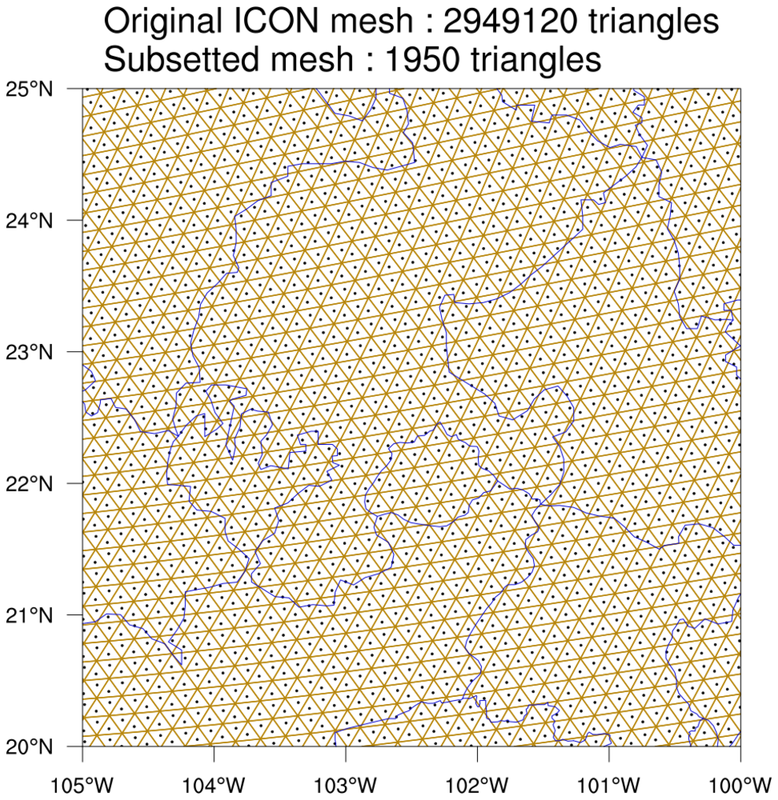 This ICON data only has 20,480 triangular cells, so the whole mesh is drawn in this case. See datagrid_11.ncl below for an example of drawing an ICON mesh with close to three million cells. datagrid_11.ncl: This is an example of drawing the edges and centers of an ICON triangular mesh using gsn_coordinates. This data has almost three million triangles which would create a very dense plot if you drew all the edges. As with the previous MPAS example, an area of interest was selected using the special gsnCoordsMinLat, gsnCoordsMaxLat, gsnCoordsMinLon, and gsnCoordsMaxLon resources, making the drawing of the mesh less dense and significantly faster.